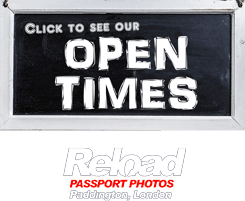 Based in Paddington, London, our Passport photo studio specializes in taking Denmark passport photo and visa photos. We have trained personnel in our store and they are able to produce Danish passport photo and visa photo that meet the requirements of Danish Government, in terms of suitable lighting, background and a number of other important specifications including biometric data. We can print your photos and prepare them according to the requirements for your Danish visa and passport applications. We are able to produce your Danish passport photo or visa photo set instantly, as we know that passport and visa applications are lengthy we will attempt to save you as much time as possible by making sure that your photograph meets all of the exact requirements of the Danish embassy, and doing it as quickly as possible. We are open from 8am until late into the evening every day. We are open even on Sundays, so, you can walk-in any day of the week and have your Danish passport photo or visa photo taken quickly. 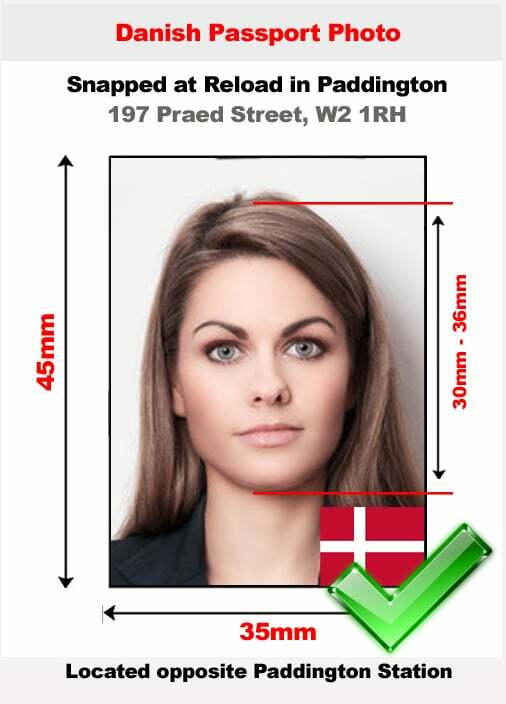 We will give you a set of six Danish passport photo or visa photo, for only £9.99. Should you encounter any issues with the photographs you receive we will retake them for you completely free of charge. You must ensure your photos are of high quality, if you want your application to be accepted by the Embassy of Denmark. More often than not, photo booth kiosks and home computers won’t be able to meet their high standards and many applications are rejected because of this. If you want your Danish passport photo or visa photo to fulfil the requirements then visit our store in Paddington, London. By picking Reload Internet for your Danish passport photo or visa photos, you let us help prevent possible delays with your application due to photograph error. As mentioned earlier, a clear picture and one that identifies you is a must when entering Denmark. Your picture should have been taken within the last six months and should have clear focus, no reflections and no red eye affecting the image quality. Also, the complexion must be clear – meaning there shouldn’t be excess make-up or products that can considerably alter your appearance. The photographs should be less than six months old. Photo background should be a light colour, we recommend white and shadows shouldn’t be visible on the face of applicant or photo’s background. The face of the applicant should occupy 70% – 80% of the photo, which means, the distance between chin to crown must be 31- 36 mm. Applicants should maintain a neutral expression, eyes open, mouth closed and they should look at the camera directly, with their head square and centre to the camera. Head-wear is only allowed for religious reasons and complete facial features should be clearly visible from top of the forehead to the chin, including the sides of one’s face. We suggest your glasses be removed for the photograph, though if you wear them always, make sure your eyes are visible and that there is no lens reflection. Also, the frame should not cover any portion of your eyes and they should be clearly visible through the glasses. All photos must have right contrast, brightness and printed on white and high quality glossed paper. Your photos should be clear, come with top class finish and we can provide that at Reload Internet in Paddington, London. When your photos don’t satisfy these requirements, the Embassy of Denmark usually rejects them. At Reload Internet, we do our best to make sure these requirements are met, so your application wouldn’t be denied. Our specifications are always being updated by the staff here at Reload Internet in coalition with the official guidelines released by the Embassy of Denmark which can be found here.